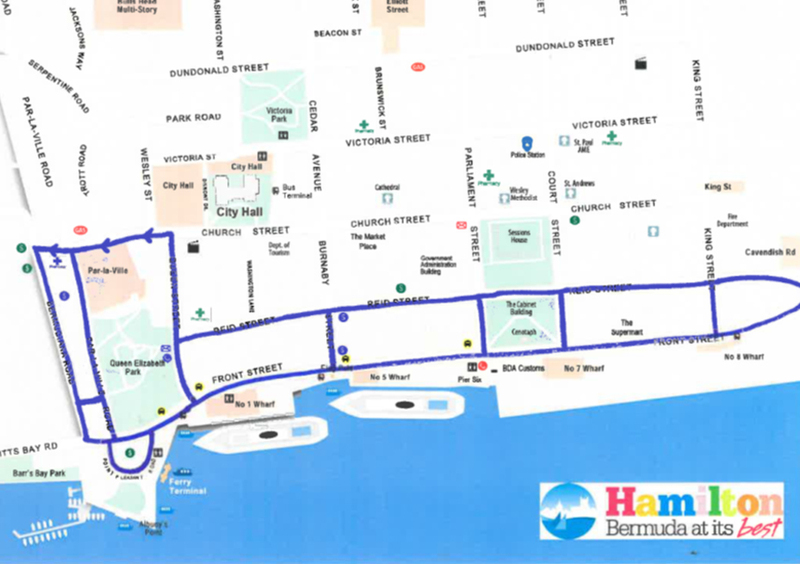 The City said there will be “extensive road closures” in Hamilton this Sunday [April 9] to accommodate the Digicel Bermuda Trifest and ITU Continental Cup. A spokesperson said, “The City wishes to advise the public that extensive road closures in Hamilton will take effect as of 5:00am on Sunday, April 9th due to the Digicel Bermuda TriFest and ITU Continental Cup. “The event is an ITU [International Triathlon Union] Continental Cup and is a major International event on the calendar attracting elite athletes from around the world. “Public transport will still be operating, but routes coming into Hamilton via Crow lane will be diverted via Tee Street so extra journey time will be needed. Likewise, there will be diversions in place for all other vehicles. “In summary, there will be no route into Hamilton via Crow Lane, Middle Road and Pitts Bay Road/Front Street during the morning hours. “From the west, the route will be via Tee Street to Middle Road to Montpelier Road and on to Parson’s Road. From the west of the City, via Serpentine Road or Woodlands Road. From the east, via North Shore Road to Marsh Folly Road to Canal Road or Cedar Avenue. “The following information lists the road closures as well as ‘no parking’ areas. Motorists are advised that all motor vehicles must be removed from these areas due to safety reasons before 5:00am on Sunday morning or they will be removed at the owner’s expense. Signs will be posted. Between Front St. and Church St. Between Church St. and Front St. Between Front St and Church St.
Burnaby St, Parliament St, Court St and King St. Between Reid and Front Streets. Between Queen St and Bermudiana Rd. From King St. to Queen St. Between Spurling Hill and King St.
Burnaby St., Parliament St., Court St. and King St. Between Reid St and Front St. Between Spurling Hill and Queen St. Between Church St and Front St. I don’t know, sir, but it looks like a giant….